“Look quick!” I shrieked to my daughter as we walked through the winding alleyways of the maze-like old Marrakech Medina hand in hand. The air was thick with the smell of spices and orange blossoms where the local women were arguing over the price of lamb at the butcher’s stall, men leading donkey carts laden with spices and herbs passed us by shouting “Balak!” (watch out! ), motorcycles whizzed past overtaking us on blind corners, shopkeepers called out to us in a mix of French and Arabic, there were rainbow-colored babouche slippers to gawk at, shiny lamps to stare at and snake charmers to dodge. “Mama, I’m not sure where to look!” responded Mina, my 5-year-old, thoroughly beguiled by the action she found herself in. “You know what would be fun to do here? A treasure hunt!” she exclaimed, picking up an Aladdin lamp from the stall nearby and rubbing it three times. “Treasure? Where’s the treasure?” asked Mikail, my 3-year-old son, peeking out from his stroller, suddenly interested in our conversation. “It’s everywhere guys! Through those hidden alleys. Around those quiet corners. In the shops. Behind the fountains. Shall we look for it together?” I asked excitedly. “We can be Shimmer & Shine!” exclaimed Mina, referring to her favorite Disney Channel cartoon series. “But first we need a magic carpet!” shouted Mikail, pointing to a carpet shop on our left. I looked up and smiled at my husband. I had known that a family trip to Morocco with young children wouldn’t be all amber-tinged, saffron-flecked and perfect. But I did see these 10 days as an opportunity to introduce my kids to a different sort of travel holiday than they were used to. One that came without a Kids Club preferably. 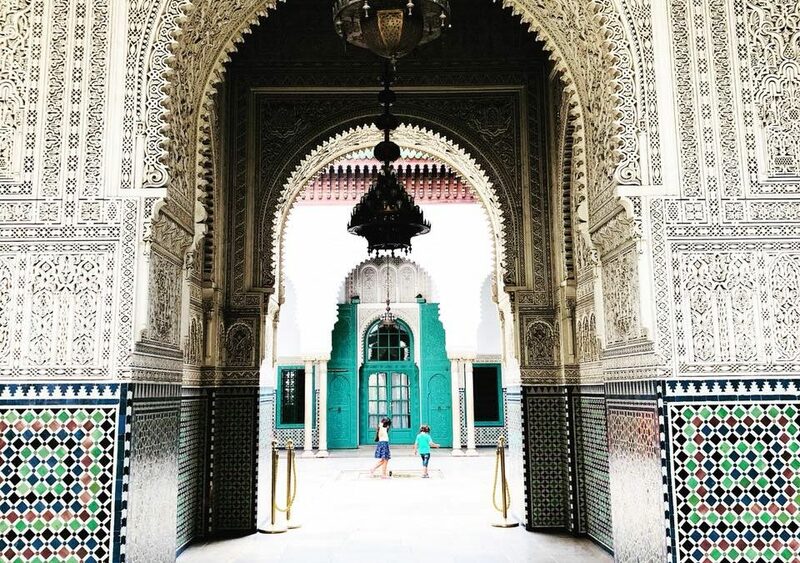 What else are the school holidays for, if not to introduce their minds to centuries old imperial cities, teeming with history and adventure, with new foods to try and market places, secret gardens, gorgeous palaces and Medina’s to ignite their imaginations? If all else failed, there would always be a hike through the mountains or a camel trek to fall back upon, right? 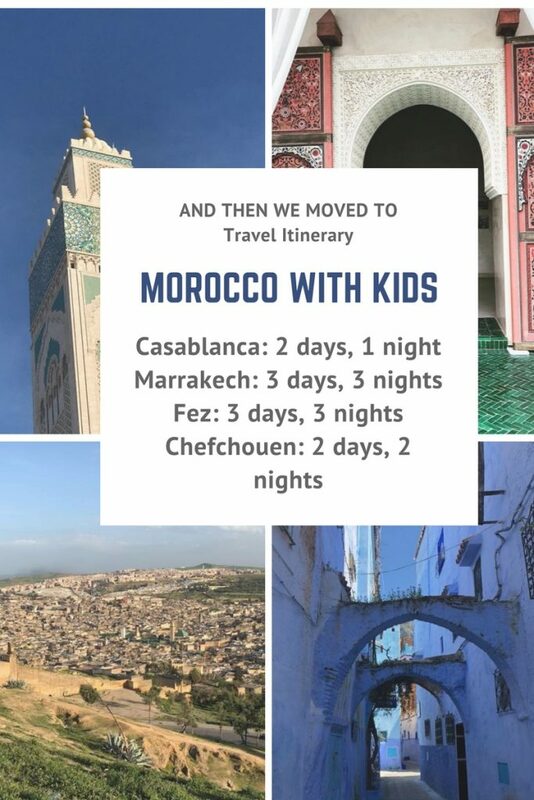 Morocco with kids was not an easy trip to plan. Most of the information I found online dissuaded me from attempting it with two kids five and under. Heat, busy crowded markets and squares, long travel times and considerable distances between Morocco’s major cities were often cited as the major drawbacks. 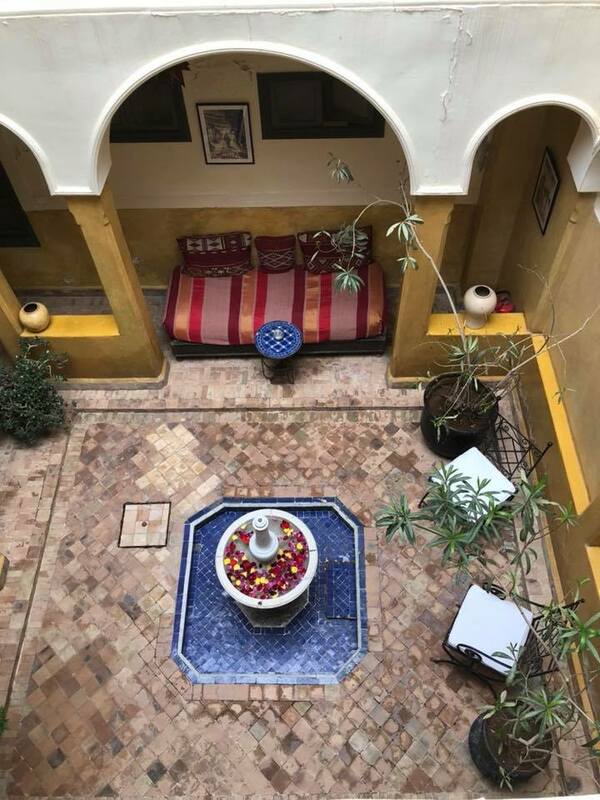 I could not find even one article that recommended staying in a traditional Moroccan riad with children because of steep steps and the fact that noise travels fast through the open courtyards. Not one to give up on a destination that I had longed to visit for well over a decade, I simply made our itinerary family-friendly. Here’s a peek at our ten-day family itinerary which allowed for enough down time between hectic travel days. Morocco is the perfect playground to capture your child’s imagination. 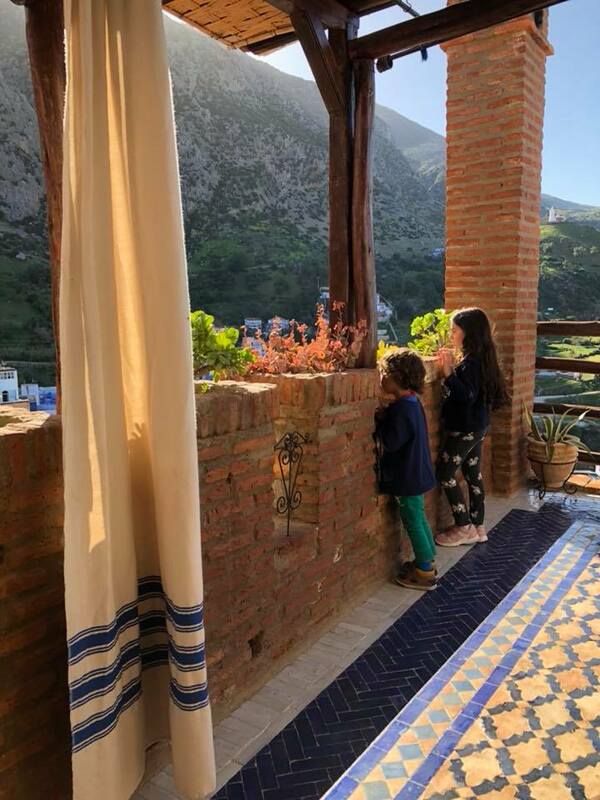 If you want to have an authentic local experience and enjoy the warm hospitality of Morocco, the best way to do this family travelers, is by staying in a traditional Moroccan Riad with your kids. Paris has its cathedrals and Dubai has its skyscrapers, but riads are what sets Morocco apart. 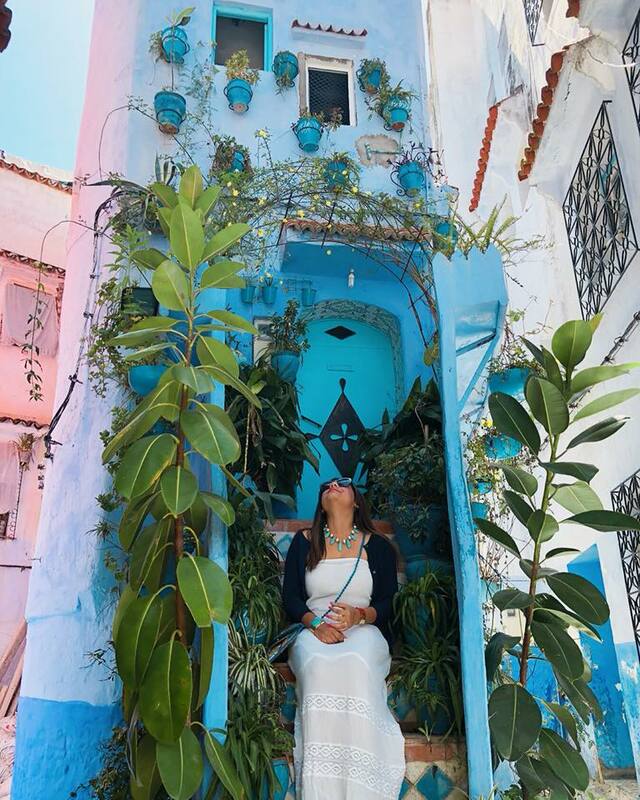 A riad is a traditional Moroccan house, with a wide, open courtyard in the middle. Enter through the brass-studded door and you will find yourself in an oasis of calm, in a bougainvillea-laced courtyard with trickling fountains and the music of songbirds. It is truly the best and most relaxed accommodation for a family traveling with kids and your kids will love exploring the gardens, jumping in the fountains and interacting with the local staff. The advantages are many; a cozy home-like atmosphere, the opportunity to sample home-made family food and introduce your children to simple Moroccan living. “There is no TV in our room Mama!” announced Mina with a rather concerned look, when we first arrived at our gorgeous Riad Laila in Marrakech. She was only used to hotel accommodation, so this was a novel experience for her. By the end of the day, she had forgotten about it, because exploring the riad was so much fun! 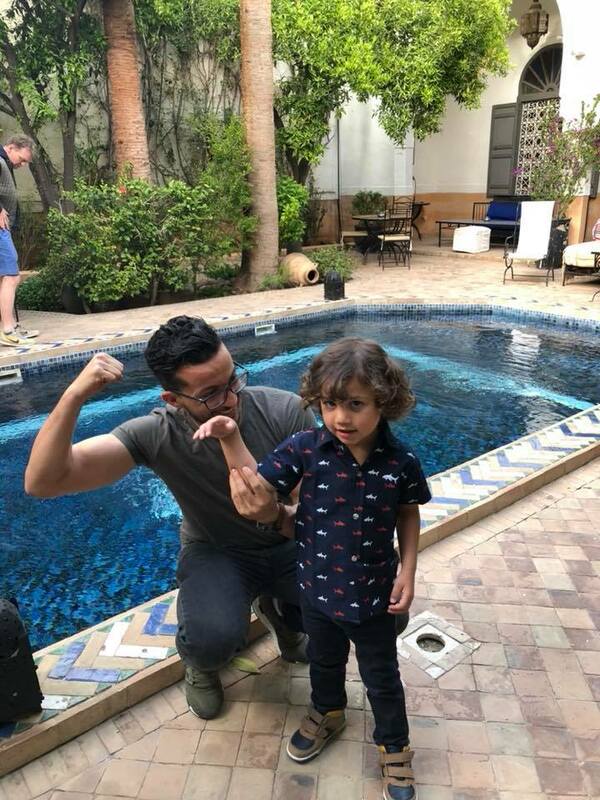 Staying in a riad took out a lot of stress usually associated with family travel – crowded spaces, big swimming pools, fancy dining restaurants, where you’re afraid your kids might either break something or be unwelcome. 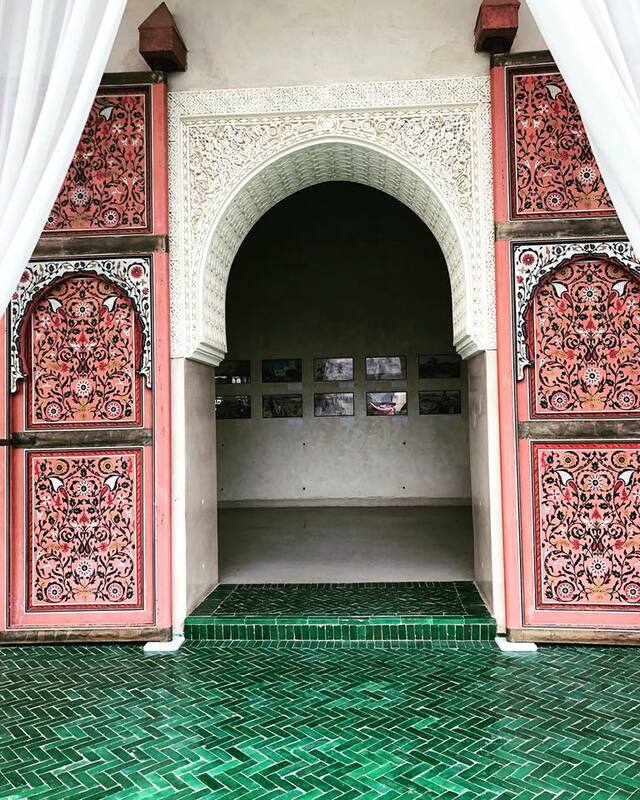 If you are traveling with children to Morocco, riads are definitely the way to go. Morocco’s Medinas are its bustling centers of activity, teeming with historical sites and souqs and bazaars. Most adults find a visit here overwhelming as the hustle and bustle in the maze-like alleyways is enough to bedazzle even the most intrepid of travelers and leave even those with a good geographical sense reaching for their maps. Google Maps has still not yet figured out Morocco’s Medinas so don’t expect you will have any luck in a day or two. But this is precisely why exploring the Medinas with your children will spark their imagination, because getting out of its streets could be a fun family exercise! 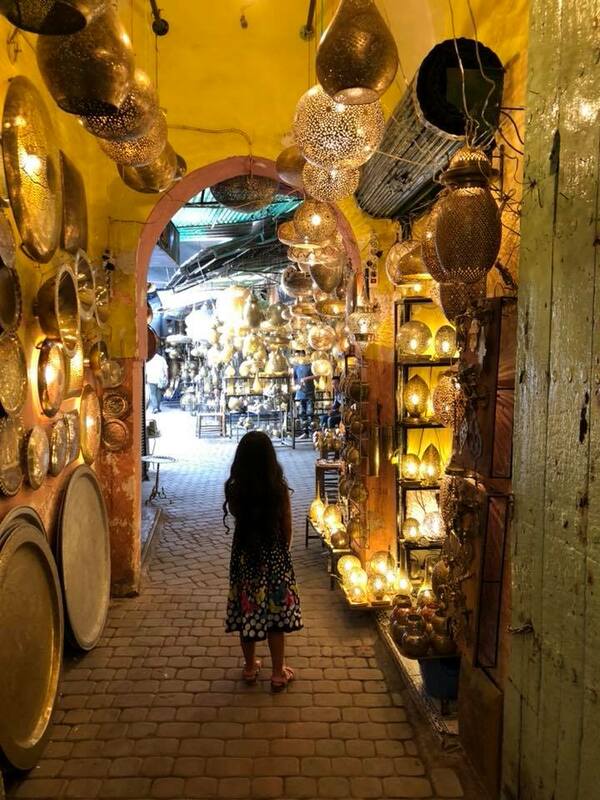 Make it creative for them, help them imagine they are on their own treasure hunt as you stop to examine spices, try on Moroccan babouche slippers, admire shiny silver teapots or peek through winding alleyways for what lies within. 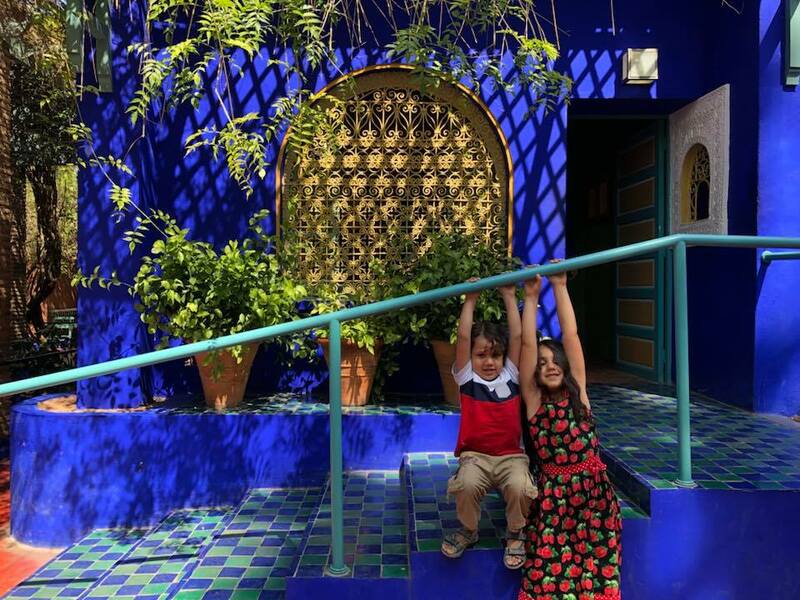 Our children loved exploring the Marrakech and Fez Medina. We got lost in both, multiple times and had to try and remember our way back, by paying attention to the “clues” we had seen and gathered. It helped us to bond as a family and gave the kids a purpose as opposed to just aimlessly wandering the streets. 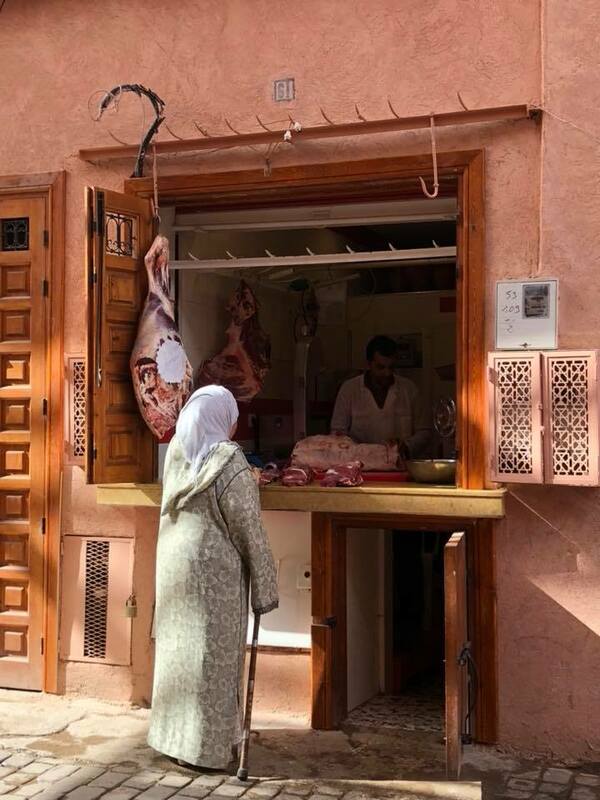 A butcher shop in Marrakech’s market place. I don’t know about your kids, but my Dubai kids think food comes from Carrefour! 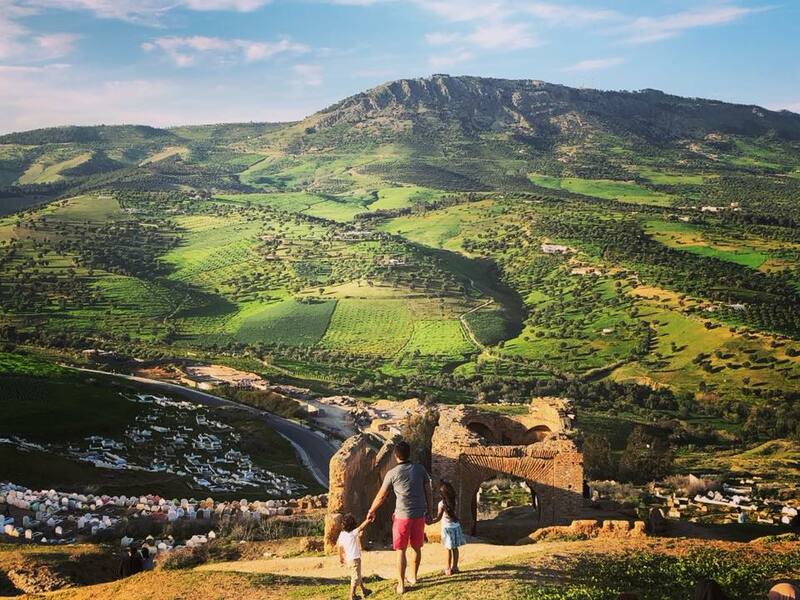 If like me, you are looking to teach your kids where your food comes from and introduce them to a real authentic market place, then Morocco is the perfect country to do so. The markets are lively, the butcher is cutting up his meat right in front of you, children are carrying trays of loaves to be baked in the local bakery and women are selling bundles of freshly cut herbs and olives. There are chickens and roosters crowing loudly, stalls laden with vegetables pile high and oh the smells! We sampled some fresh Moroccan semolina bread, olives soaked in olive oil and fresh herbs, before bargaining for some delicious Moroccan pastries covered in coconut and sprinkled with cinnamon. Don’t shy away from taking your kids to the marketplaces, they will learn a lot and probably ask a lot of questions too. A visit to the marketplace can be educational and fun! “Did you say there’s a secret garden behind these doors? Oh, I want to go see the secret garden!” exclaimed Mina. The newly opened Le Jardin Secret Marrakech is located right at the heart of the souks, and was hidden behind 9m walls, until last year. Originally this palace was built in the late 16th century as part of a complex that included the Mouassine mosque and fountain, a library and a hammam. Its recent restoration makes it the perfect spot for a family break. Stepping inside into its calm enclosure makes you finally appreciate this city of extremes. Outside there is total chaos, but inside this secret garden, the only riot is that of exotic fauna from all around the world. There is an exotic garden and an Islamic garden. There is a fountain of course with beautiful mosaics, tile work to interest the most ardent photographers and several serene moments to enjoy here, while the kids run around. There is also a café with sweeping rooftop views of Old Marrakech to sip some mint tea and fresh juices quietly. 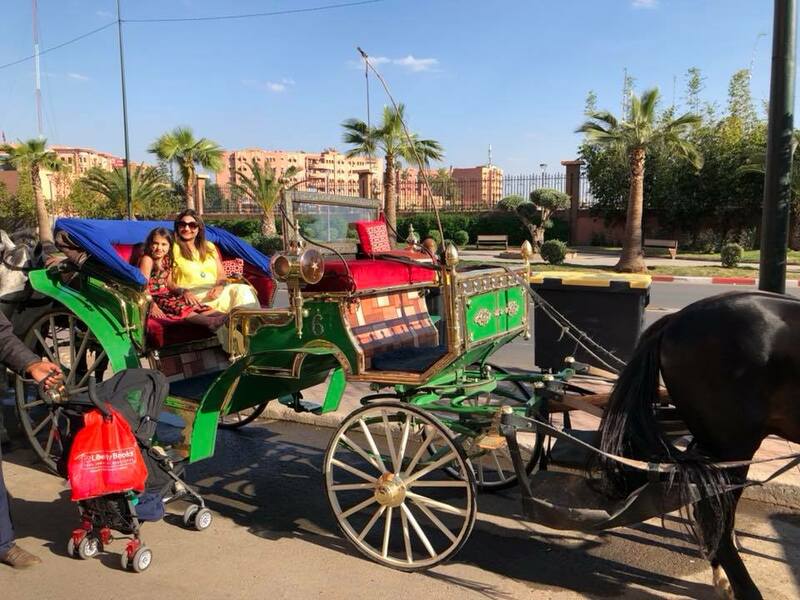 Marrakech’s gardens were truly a pleasant surprise and if you are traveling with kids, a visit is necessary for enabling your children to let off some steam. 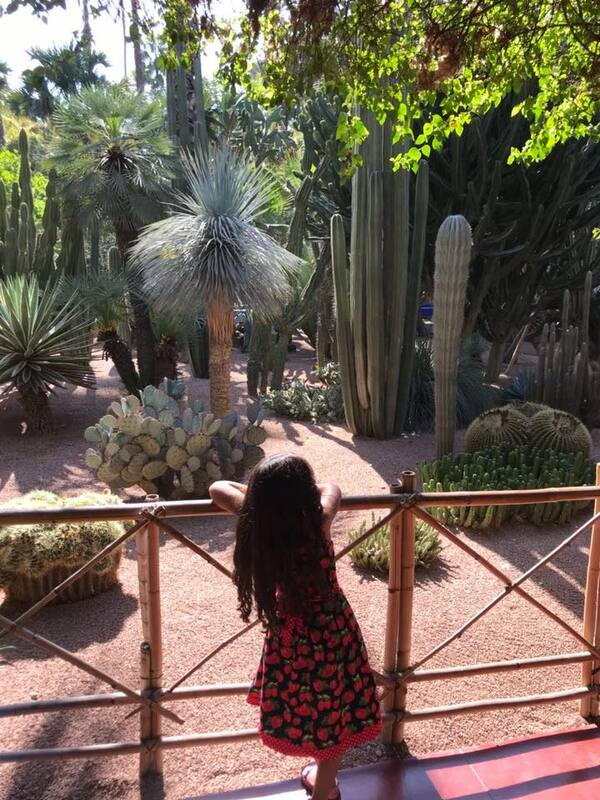 The next day, of course we also explored Marrakech’s most famous gardens, Jardin Majorelle. 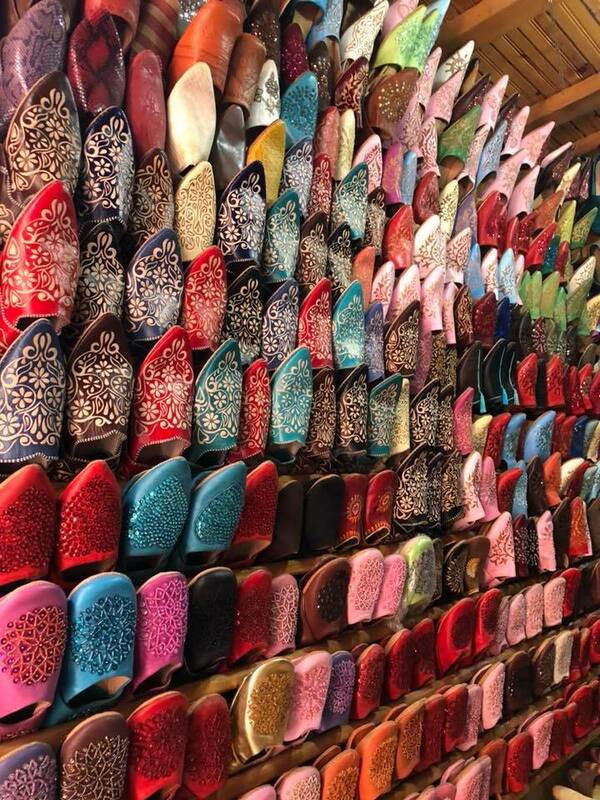 Its former owner Yves Saint Laurent, whose ashes are scattered here claimed “Marrakech taught me color” and a visit here can easily make you see why. In this bright blue manor, surrounded by turquoise benches and yellow flower pots, the colors here are dazzling. Mina and Mikail loved the frogs and the turtles they spotted in the water-lily pond and a visit to the Berber museum was also enjoyed by all of us. Mostly, they just enjoyed running through bamboo laden walkways and calling out to us to share what was around the corner. 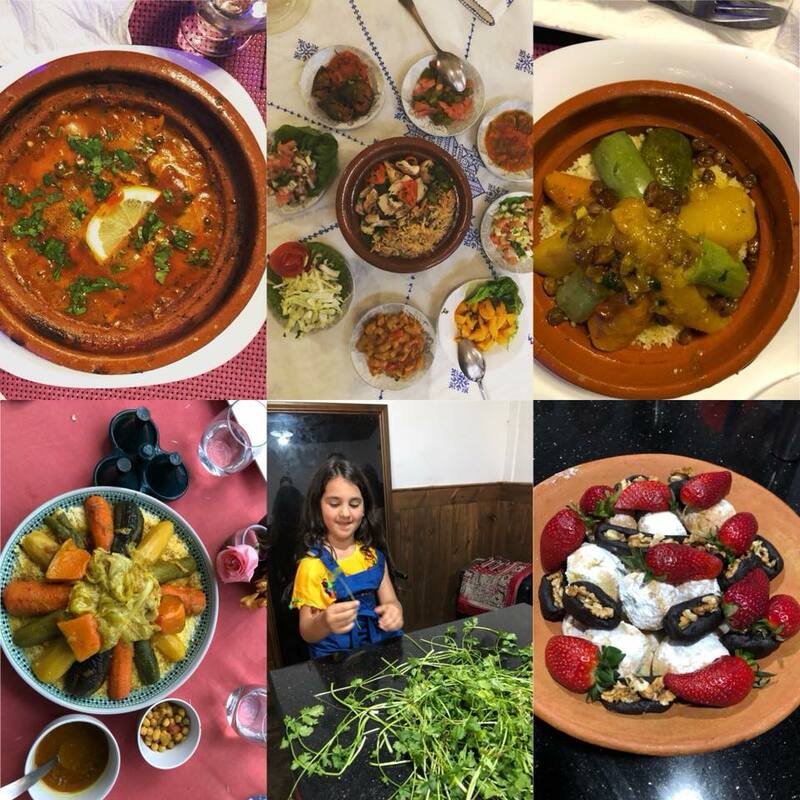 Taking a cooking class together is a great way to introduce your children to Moroccan cuisine and is thus a family friendly activity that I highly recommend you try in Morocco. We signed up for a four-hour cooking class with Cafe Clock, in Fez with both kids. You can also sign up for a two-hour bread-making class or a patisserie workshop. After planning our menu, we shopped for our ingredients in the souq, before returning to Café Clock to chop and cook and then to enjoy the feast we had prepared. It was the perfect place to hone our couscous-making skills and the cooking class and staff were both supremely kid-friendly. The staff involved our children, and Mina had fun chopping parsley, soaking couscous and stuffing date palm paste with almonds and strawberries. I noticed she was a lot more enthusiastic about trying new food to eat after our cooking class, she even tried the spicy local bread! I know traveling with kids can feel super stressful sometimes. But when you travel with them to a country like Morocco, where family is everything and children are a language onto themselves, you will experience the locals friendly and welcoming attitudes towards children. People will bother you less, shopkeepers will welcome you in and restaurant owners will call out to their own kids to come and play with yours. Even the mosques and madrasah’s that we visited were children friendly! Nobody minded Mikail running around the Kairaouine Mosque in Fez, one of the oldest and most conservative mosques in Fez. I also realized that traveling with our kids meant we made deeper connections with the locals and were offered help when we needed it. After not getting any first-class train tickets since they were sold for our journey for Casablanca to Marrakech (as recommended for tourists in all the guide books), we sat in the second-class compartment, with the locals where there is no assigned seating and just a free for all. It was not air-conditioned, it was hot, dusty and chaotic with no place to sit, there were people selling bread and drinking mint tea over our heads, many were smoking (right under the no smoking sign), while others were reciting the Quran out loud and swaying back and forth to the rhythm. But many locals helped us get on with our many suitcases, two men gave up their seat for us, a lady shared her bag of peanuts with Mina while a young girl played with Mikail’s curls. Everyone gave us tips on what to do and see in Marrakech, while one lovely lady invited us to our home in Marrakech and gave us her number! 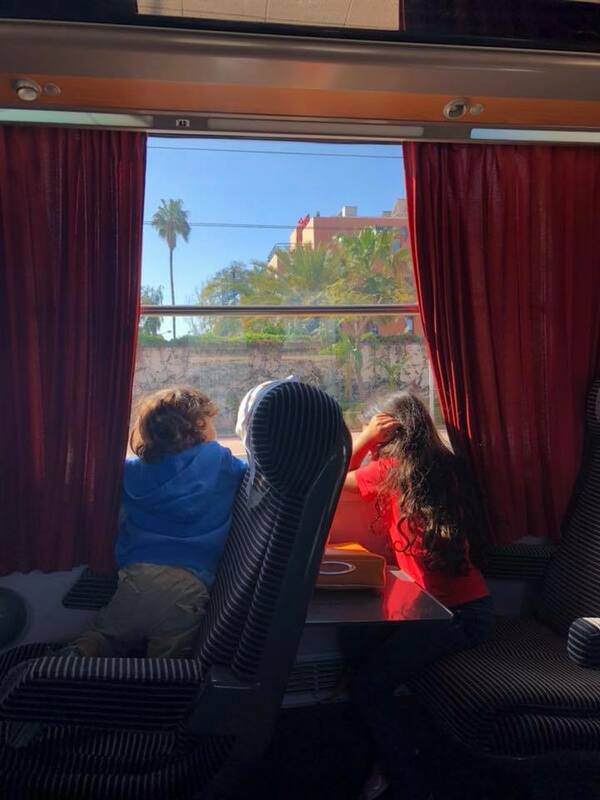 Traveling with young kids is not always east, but completely worth it for the experiences and connections it allows you to make, especially in a place like Morocco. “Blue is my favorite color!” exclaimed Mikail in glee as we arrived in Chefchouen. He was ecstatic to find each street painted blue. This was an unexpected way that my children loved exploring Morocco. First came Casablanca (the ‘white city’ as it was called by the Portuguese settlers), then came Marrakech (the rose city where everything from buildings to the sunset sky is painted red). After that came Fez (the yellow city), followed by the most vibrant Mountain village town of Chefchouen; also known as the Blue Pearl, for its blue streets, doors and windows. 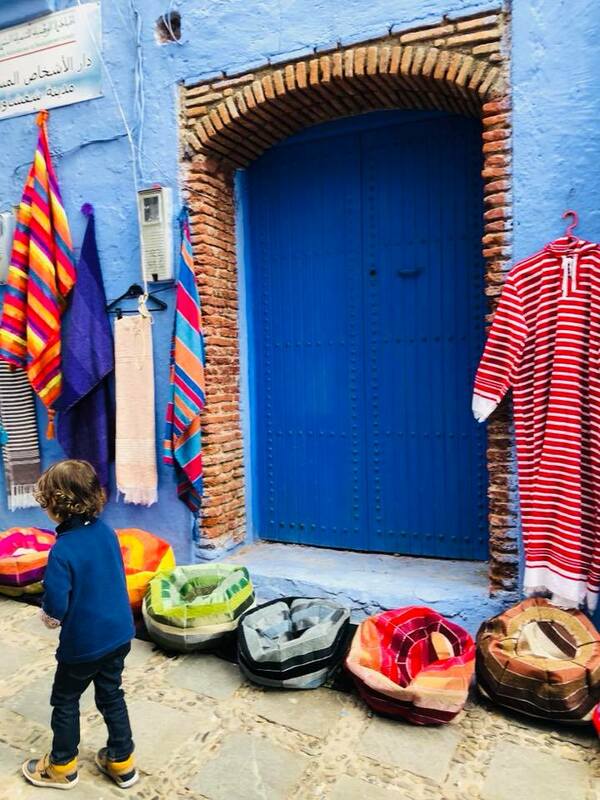 Morocco’s vibrant colors had us all enthralled, but for my children it was the first time they had ever seen each city represented by a particular color. When it was time to draw and write in their travel journals, it was apparent that the color of each city had stuck with them and jogged their creativity. It was a fun way for them to explore and remember each city. “Desert or mountains?” we asked the kids. They both voted for mountains. We agreed, given that we already live in a big desert called Dubai. Morocco is blessed with a variety of natural landscapes. We enjoyed a gorgeous hike up the Middle Atlas Mountains, which included incredible mountain scenery, waterfalls, forest walks and less hair-rising passes than the High Atlas, which made it easier to do with kids. We simply arranged for a guide through our riad and kept it flexible, which meant when the kids were tired, we headed back. You might also like to experience a camel trek through the Sahara Desert instead, which is an easy day trip from Marrakech. Regardless of what outdoor activity you choose, enjoying Morocco’s variety of landscapes is a must. It is best to speak to your riad as several offer day tours for reduced prices and cheaper packages than other tour companies. 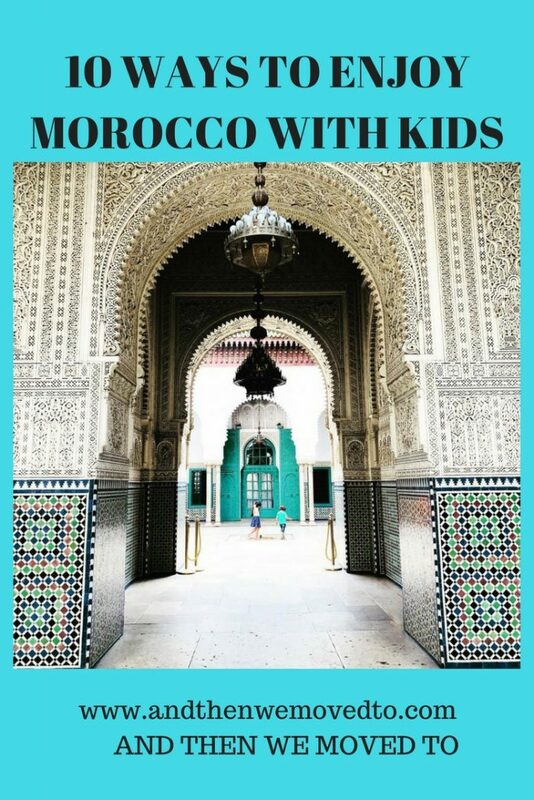 This was one of our favorite ways to enjoy Morocco with the kids. Travel is a great way to expose kids to hearing and learning different languages and multilingual Moroccans had us enthralled. It is common in Moroccans to mix languages, so they produce a beautiful mix of French, Arabic, Berber and even Spanish thrown in. “Mama, they mix Arabic and French here, just like you mix Urdu and English! Its funny, the man there just said “yallah, s’il vous-plait!” giggled Mina. “Bonjour, ma’salaama!” she shouted back, giving it a try herself. It was true. I realized traveling to multilingual countries is a great way to normalise multilingualism for my children. If you are raising bilingual or multilingual kids, exposing them to these environments can help in embracing diversity in languages. Morocco helped my children see that speaking and mixing multiple languages can be cool and fun! Traveling with kids has a way of forcing you to slow down, which is a good thing. One of the experiences we enjoyed was indulging in slow travel with the kids, and to give our bodies and minds the time to adjust from one city to the next. Our 7-hour train journey from Marrakech to Fez was actually one of our best traveling days as a family! Kids are easier to entertain on train rides than on air planes, and this time we had prepared in advance. Snacks were bought, iPads were charged, first class tickets secured in advance and seven hours seemed to fly by. Our car journey from Fez to Chefchaouen (three and a half hours) and then back from Chefchouen to Casablanca (five and a half hours) were definitely more tiring. We tried to make it as comfortable for ourselves. Instead of a taking a bus, we hired a private car (with WIFI) through Tangier Taxi and enjoyed the spectacular Riff Mountains and scenery of nearby towns. Northern Morocco felt very different from Marrakech, and it was seeing these different sides of the country in our travels that helped us to take it slow and enjoy Morocco with the kids. Three year old Mikail did not like the taste of the local milk and went completely off milk for 10 days! He did enjoy their fresh juices though, so we substituted with more vitamins and just made sure he stayed hydrated. Five year old Mina got pricked by a cactus. Nothing serious, but it did warrant a quick trip to the pharmacy. Luckily, there was one quite close to us in the Medina, and one of the lovely staff members at our riad quickly ran out and got us some band-aids and antiseptic gel. Using less-than-clean public bathrooms on the road, was a challenge with two young kids. I started carrying extra wipes, toilet paper, a water bottle and hand sanitising gel with us to avoid major hygiene issues. Mikail slipped into a water fountain in Chefchouen! I say slipped, but his sister claimed that he jumped in 😉 This was not surprising given his love for fountains. Nothing serious, but he did have to sit in his wet clothes for a bit as the local kids gave him amused looks. Mina took off her shoes to go inside one of Fez’s oldest mosques and then couldn’t find them when it was time to go! The lovely caretaker of the mosque had kept her little shoes separately so they wouldn’t get lost in the messy adult shoe self. We were exploring Morocco’s busiest (and most notorious) square Jemma Al Fna at night with the kids. A tout came and without asking us gave both kids a musical drum in their hands to shake. We said “no, no thank you!” but he would not take them back. After a few minutes, he came and asked us for some money, at which point we promptly returned the drums. He then claimed we had used them and owed him money. Lesson learnt: do not accept anything you are not willing to buy! When we arrived at the beautiful Pasha’s Courts and Palaces in Casablanca, Mina insisted on “meeting the Queen who lives here” and did not want to leave without a formal introduction to at least a princess or a prince. Mikail threw an epic tantrum in Chefchouen, because I insisted he hold my hand through its busy streets. To deal with his major meltdown, I took him aside to a quiet alley to calm him down. Then I turned around and discovered the cutest little turquoise house, which made us both shout in glee and excitement. Turns out even toddler tantrums have an up side when you’re in gorgeous Chefchouen! Family travel; there is truly never a dull moment. But don’t let it stop you from taking your kids with you on your next adventure! Hi Mariam, I love reading of your amazing adventure in Morocco, meltdowns and all, and your fabulous images of this beautiful place! 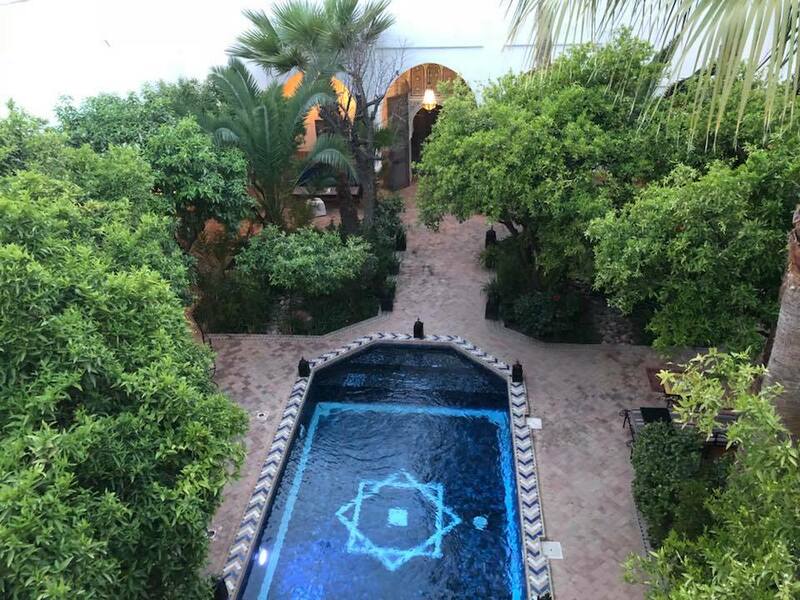 Your Riad looks gorgeous as well, so much better than a hotel room. Your visit to the former home of Yves St. Laurent inspired me to do more online research of this amazing place – hopefully someday I will visit there as well! As always, your writing and photos are brilliant!